Throughout history, and in every culture around the world, Garlic has been revered as Mother Nature’s natural Antibiotic. Garlic is, and has been for thousands of years, renowned for its’ antiviral, anti-fungal, antibacterial, anti-parasite and immune-supporting role in both supporting and maintaining good health. Garlic is also a natural ‘blood cleanser’. The ‘active’ part of Garlic is Allicin, produced from two components: Allinase and Alliin. These are kept completely separate in Garlic until it is either attacked by microbes or crushed/chewed (eaten). 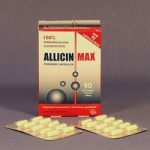 Allisure Allicin is many times more powerful than ordinary Garlic and as it is more alkaline, it can more readily absorbed by the body, penetrating cell walls and reacting with more micro-organisms. However, independent research and consumer testing in the UK has shown that most powdered garlic products are inactivated by stomach acid, which means that they are unable to produce any allicin at all. recent studies have shown that allicin yields are purely theoretical and in practice less than 5% of this ‘potential’ actually gets released. 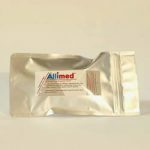 Allisure Allicin is different. It is the result of a patented process which provides real allicin liquid. It is the first health food supplement to provide a real 100% allicin yield. Allicin, the key active ingredient from fresh garlic, produces ALL the beneficial derivatives that contribute to good health and well being. 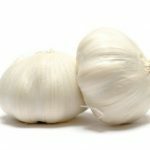 All Allisure Allicin Products are made from fresh, raw garlic. Heads of garlic are specifically selected to ensure that they contain significant enzyme activity (allinase enzyme). Garlic heads are split into cloves, which are left unpeeled and then subjected to crushing, filtration and temperature controlled extraction process designed to produce stabilised liquid allicin dissolved in water. No chemical solvents are used. 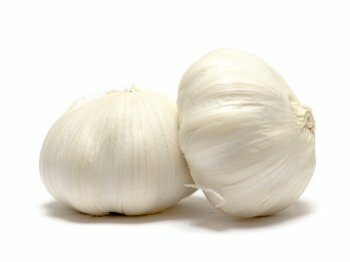 The alliin component in fresh garlic is subjected to complete conversion by the allinase enzyme to ensure a large volume of active allicin is harvested. The volume of allicin produced is directly related to the enzymatic activity. All Allicin products have a 100% Allicin yield guaranteed. Capsules contain 100% Stabilised Allicin Powder and non Genetically Modified maltodextrin – no other exipients are added. The capsule shell is made of plant cellulose and is suitable for vegetarians and vegans. Allicin Liquid and Allicin Spray contain 100% Stabilised Allicin and Water, nothing else! Nutritional Information (See above too) Professional Strength – more powerful and effective much quicker. Better value for money with more effective results. 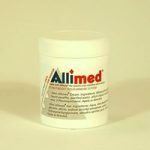 Each Allimed® capsule contains 450mg stabilised allicin (Allisure) and non-GM maltodextrin. The capsule shell is of plant origin. 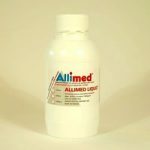 Allimed® can be administered as a liquid for faster bioavailability. Up to 10x more effective than Capsules. Starting dose is 1ml per day rising to a maximum of 3 x 5ml daily. More can be taken if required. 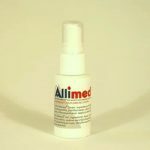 Will also refill the Allicin Spray Bottle 8x.